Celebrity Cruises has unveiled the designs of several areas of the new Celebrity Edge cruise ship, which will homeport in Fort Lauderdale, Florida, and make its first sailing on December 16, 2018. The ship has two seven-night itineraries: An eastern Caribbean cruise visits San Juan, Puerto Rico; Tortola, British Virgin Islands; and Philipsburg, St. Maarten. The western Caribbean calls on Key West, Florida; Costa Maya, Mexico; Cozumel, Mexico; and George Town, Grand Cayman. Travelers will also have the option to book back-to-back sailings for a 14-night journey. Celebrity Edge will be joined by three sister ships in 2020, 2021 and 2022. Celebrity is one of five cruise brands operated by global cruise vacation company Royal Caribbean Cruises Ltd. According to a Celebrity Cruises press release, Celebrity Edge was designed completely in 3-D, and the ship can accommodate 2,918 guests. 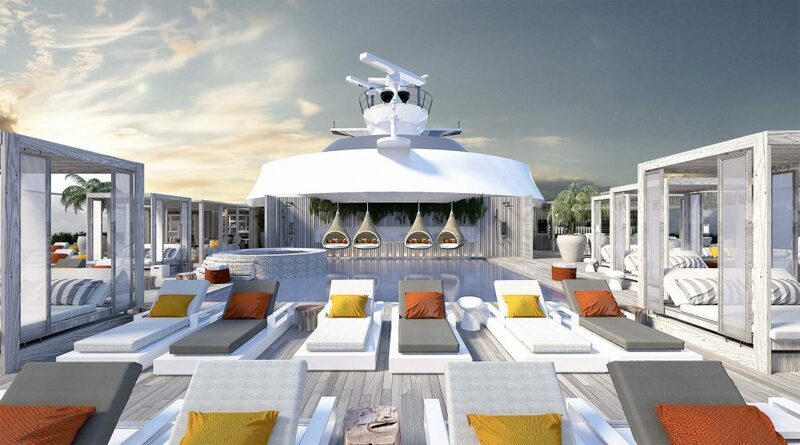 Designers who are working on the ship’s design include interior designer Kelly Hoppen MBE of Kelly Hoppen Interiors and architect Tom Wright of WKK. American designer Nate Berkus serves as Celebrity Edge’s design ambassador. Other designers on the team are to be announced. 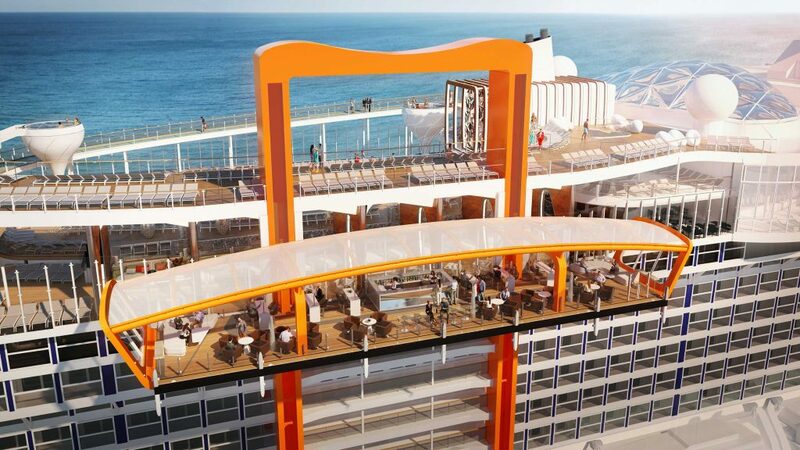 Cantilevered from the side of the ship, the Magic Carpet makes Celebrity Edge’s distinctive profile recognizable from miles away. The size of a tennis court, this incredible engineering feat scales the 16-deck ship through the day and evening, positioning at four of the ship’s decks, transforming into a new and exciting experience at each one. At the summit of the ship on Deck 16, the Magic Carpet becomes the ultimate specialty restaurant offering a special “Dinner on the Edge” for 90 guests. Alongside Deck 14, Magic Carpet becomes an open-air expansion of the main pool area. On Deck 5, Magic Carpet extends one of the ship’s specialty restaurants into the most amazing al fresco seating imaginable, and at its lowest position on Deck 2, Magic Carpet is a key component to the Destination Gateway, a luxury embarkation station where guests will be whisked away aboard sleek Edge Launches. “The Retreat” is an ultra-exclusive private utopia reserved exclusively for Suite Class guests, featuring a luxurious pool and sun chairs for ultimate relaxation. Also part of this special space is the Retreat Lounge, which brings heightened levels of style and sophistication to Celebrity Edge and boasts around-the-clock personal butler service, and the exclusive Suite Class restaurant Luminae @ The Retreat. 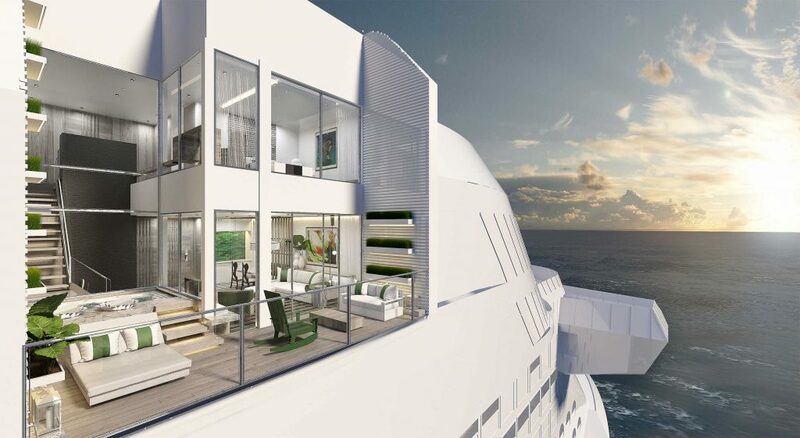 With Celebrity Edge, Celebrity has more than doubled the number of available suites, adding two spectacular new categories. At the top of the line are two new Iconic Suites situated above the ship’s bridge. These near 2,600-square-foot, two-bedroom, two-bathroom suites feature mind-blowing views thanks to panoramic windows enveloping the dining room, living room and bedrooms. The 700-square-foot veranda offers a 270-degree view of the ocean. The Iconic Suite offers mind-blowing views, thanks to the panoramic windows enveloping the entire dining room, living room and bedroom. Together, with the veranda, these two-bedroom, two full bathroom suites are exclusive to Edge Class and extend across 5,000 square feet. Another new Suite Class comprises six split-level Edge Villas, which offer stunning views from two stories of windows, private plunge pools and direct walk-out access to The Retreat Sundeck. 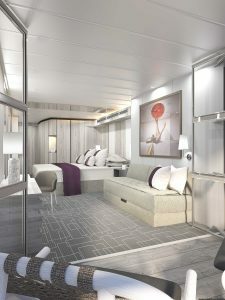 The two-level Edge Villas are one of the new Suite Classes aboard Edge. The suite boasts two stories of windows, an atrium stairway with terrace views and a three-foot-deep plunge pool. The new Edge Stateroom with Infinite Veranda turns guest quarters into a seamless space—from the room’s door all the way to the water’s edge. With the simple touch of a button, the stateroom offers open-air access to the sea, making the entire room a veranda whenever they wish. Hoppen also designed the two two-bedroom, two-bathroom Penthouse Suites with large soaking tubs on the veranda, large dual walk-through showers, and expansive walk-in closets, and the 146 large, outward-facing Sky Suites. All suites and double occupancy Edge Staterooms are fitted with exclusively designed plush king-size cashmere mattresses—an industry first—and offer personal butler services and access to The Retreat.